We at Office Reality love ingenious design and forward thinking, so when we saw the “I Used to be a Washing Machine” project, we thought it was something worth sharing. The idea of a lounge chair, usually has a high back, fitted with thick cushioning and are normally used within living rooms or break out and café areas in commercial environments. Perhaps not winning any awards for the chairs aesthetic appearance, the initiative that was used when crafting the chair should definitely be given credit. When most people’s kitchen appliances break to beyond repair, their first thought is to scrap them. This is not the thoughts of the designer Tony Grigorian, who saw a lot of potential when her washing machine broke down for good. Not content with just one chair, Tony managed to craft three seats from her broken down metal machine, a lounge chair, folding seat and a stool with back. This type of work is becoming more and more popular within many industries including furniture industries and is a process known as up cycling. Up cycling is the idea of taking something that is useless and transforming it, using the same materials that was originally used to create something that is useful. Shabby chic is the most common example of this where furniture that has been rendered useless and rubbish, is given a new coat of paint or an altered structure and is sold as a vintage piece of furniture. The “Buddy Armchair”, is made completely from the structure of the washing machine, with the chairs frame being made from the back, bottom and side metallic panels of the washing machine. The shape has been cut into place, but the overall appearance still resembles its former glory. 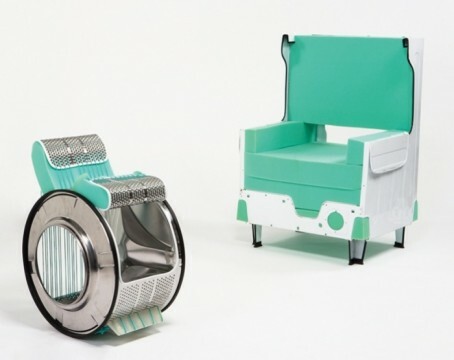 The “Dramms Stool” and the “Dorry Chair” uses what is left of the washing machine forming two further seats. This shows just exactly what you can do with what some people would call useless junk!